Mohair is the finest material for Teddybears. Mohair is made from one of nature`s finest sources for natural fiber, the Angora goat, and it is very long and naturally wavy. When sheared (this usually occurs twice a year) it is called mohair. The term "mohair" is derived from the Arabian word "Muhayar" which literally means "the fabric of goat hair". Despite the name similarity there is no relation to the Angora rabbit. The collection of this noble hair does not require any animals to be harmed!. Angora goat fibers are naturally white, curly and shiny and have a remarkable strength when made into a pile fabric. These characteristics together with the noble appearance, silky feel and sheen make mohair one of the finest fibers offered by nature. Hermann Spielwaren create beautiful Mohair teddy bears in Coburg, Germany in the traditional style. They have produced teddy bears for the world for three generations. What started with just a handful of teddy bears has grown into an amazing variety of unique bears each with their own personality. 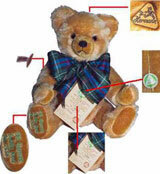 The old trademark of Max Hermann, the green triangle and the portrait "bear with the running dog", is still very evident on all teddy bears produced by the HERMANN-Coburg Company. This trademark symbolizes the strong values, ideas and commitment of a man whose entire life was characterized by his love for teddy bears -classic, timeless, beautiful teddy bears.